McDonogh Capital Investments, a subsidiary of Galway-based Thomas McDonogh & Sons Limited, has lodged a planning application for the first phase of a new market defining office campus, Eastgate, to the east of Galway City. The proposed Eastgate development is ideally situated to the east of the Galway city near arterial roads as well as the future N6 Galway City Ring Road when completed. The entrance to phase one of the scheme will be from Ballybrit Industrial Estate and will not interfere with the existing McDonogh Trade Centre business, which is located on an adjacent site. McDonogh’s historically were a trading company based in Galway since the 1880s specialising in fertiliser manufacturing, animal feed manufacturing as well as a builders merchant and are now primarily focused on property investment. The project, which is to be delivered over three phases comprises office accommodation, public plazas and a hotel. Thomas McDonogh & Sons Limited have a proven track record of delivering high quality developments having been involved in the development of over 800,000 sq ft of office and hotel accommodation in Ireland, France and Belgium, including the Dockgate building and Jurys Inn hotel in Galway. The company retains a 400,000 sq ft office portfolio in Belgium. The Eastgate office campus has been designed by award winning Dublin architectural firm BKD architects. 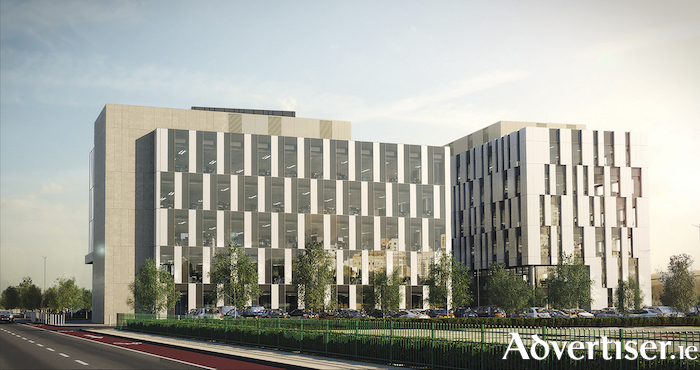 The first phase of the proposed development will consist of 187,649 sq ft of Grade A office accommodation provided across three impressively designed buildings. The overall development value is in the region of €120 million, phase one to cost around €50 million. These buildings will be situated around an extensive public plaza incorporating large open areas and green space. The development will be finished to the highest international standards, both from an aesthetic and sustainability perspective. All buildings have been designed to achieve LEED (Leadership in Energy and Environmental Design ) Gold certification. LEED certification constitutes the globally recognised standard for building sustainability achievement. Later phases of the development will necessitate this business being relocated to another purpose-built location. Real Estate advisors Cushman & Wakefield have welcomed the planning application which will deliver much-needed modern office space to the east side of Galway City. Page generated in 0.2506 seconds.